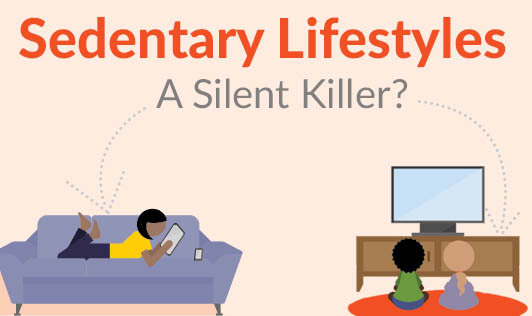 Sedentary Lifestyles: A Silent Killer ? Life has become so much easier nowadays. Gone are the days when we had to wake up early and reach in time to take a bus to work. Today we have cars to drive around in, washers and dryers to dole out squeaky clean clothes, and dishwashers to clean the utensils. Mankind is constantly inventing ways to replace manual effort. This leaves us with nothing much to do other than lounging in front of a TV or playing games on the laptop. While technology has made our lives so much easier, it has also become the reason for leading a sedentary lifestyle. Inactivity is a silent killer. Lack of physical activity leads to weight gain and diabetes, accompanied by the rapid increase in the incidence of heart diseases, strokes, and diabetes. Therefore, it’s time to get off the couch and get moving. Start with moderately-intense activities. Also, get your loved ones involved by making time for fun family activities. They add to quality time as well as overall fitness. At work, move around as much as you can. Instead of conversing through online chats, try to walk up to the person you wish to talk to. Take the stairs and swap unhealthy snacks for healthy ones. It’s crucial you remember that you can hit your weekly activity target but still be at risk of ill health if you spend the rest of the time sitting or lying down. Therefore, try to remain as active as you can through the day and try to perform as many household chores as you can on your own.